Trinity Catholic's Jon Lyons drives to the basket past Staples' Ben Casparius during their basketball game at Staples High School in Westport, Conn., on Tuesday, Feb. 3, 2015. 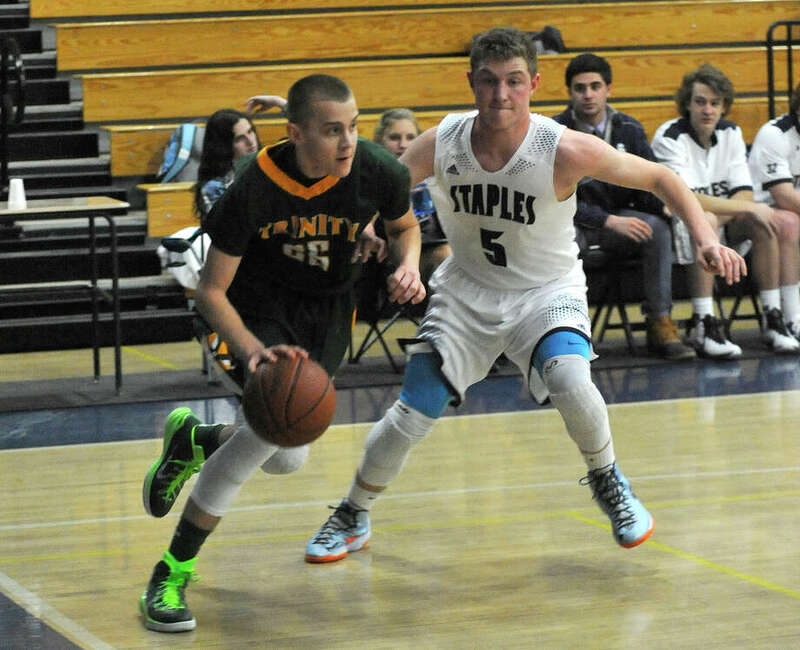 Staples won, 60-58. A promising start turned into a bitter finish for the Staples boys basketball team last season, and a number of promising returners with multiple seasons of varsity experience are back for 2015-2016 looking to end the school’s four-year FCIAC playoff drought. Last season, Staples started out 8-6 before dropping its final seven games — including a first round state playoff game at Hillhouse. Now in his ninth season as head coach, Colin Devine is excited to make another run at the postseason. Devine has a trio of juniors to depend on and carry the load at both ends of the court. Ben Casparius — a University of North Carolina baseball commit — was a lights-out shooter for the Wreckers a season ago and spent just as much time on the court as a freshman. With baseball requiring an intensive commitment, Casparius — who scored 27 points in a game against St. Joseph last season — is eager to return to the hardwood for another winter. Devine referred to Sean Pritchett as his defensive leader, a strong vote of confidence for a player who can do everything on the court. Justin Seideman was thrown into the fire as a primary ball-handler as then-senior Jake Melnick missed the season with a shoulder injury. Seideman — who can also finish at the rim — grew into the role as the season progressed and the experience will be beneficial in 2015, according to Devine. “We’re going to count on Justin to score the ball more and get us into our offense, and on defense all of our guards are going to have to rebound,” said Devine. Seniors Jared Vishno and Dylan Dreyfuss — a pair of guards — will captain the team this winter. Devine added that sophomore Max Sussman and 6-foot-5 junior Brendon Massoud will also contribute. As a whole the group will be a perimeter-based attack with the departure of center Nick Esposito and forward Connor Whelan. The Wreckers scrimmaged defending Class L champion Bunnell to get its preseason underway, and will open the regular season Dec. 22 in a tournament with Darien, New Canaan and Trumbull. The FCIAC chase officially begins Jan. 5 against the Eagles. With the departure of many top talents to Prep school programs — plus the graduation of many first team All-FCIAC selections — the competitive balance of the FCIAC is stronger than ever. With the departure of Harding and Bassick to the CSC, each team will play 16 league games.